Phantom Chess Doesn't Actually Rely On The Supernatural | OhGizmo! 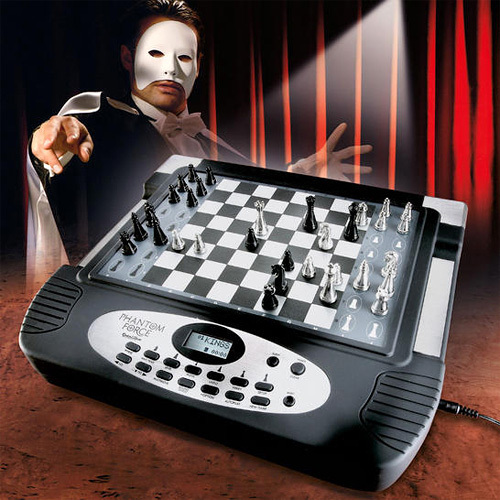 Despite the haunting product shot, Phantom Chess doesn’t have any connections with the supernatural, so you ghost hunters can just move on. The real ‘secret’ is good-old fashioned electromagnetism, though I’m sure you were able to figure that part out on your own. (It’s not like self-playing chess games are a recent innovation.) It’s designed for those who are truly lazy, and moving your piece is as easy as tapping the start and target squares and letting the game do the rest. In addition, not only will taken pieces be automatically moved to the side of the board, but you can even turn on Battle Chess like sound effects to make things more exciting. Phantom Chess is powered by an 8-bit dual processor and has an ELO level rating of 1400 from the SSDF. (Swedish Chess Computer Association or Svenska schackdatorföreningen) In comparison, Garry Kasparov has a rating of over 2800, so while you won’t be competing against the most brilliant minds in chess, I’m sure the Phantom could still give most of us a good schooling. You can pick one up from Pro-Idee for about $213. I think this is a nice gift to a chess fanatic or collector. Nice!